Besides being one of the most controversial gadgets of the past decade, the lowly drone might just be the future of event photography. The little quadcopters are more affordable than ever, they are continually becoming more user-friendly, and the concept is easy to sell: stunning photography elicits emotional reactions. Plus, who ever said controversy was bad for a party? Drone technology is even cooler than you think. No longer reserved only for film studios and Red Bull stunts, drones with and without cameras are easily available to consumers. Some of the most interesting ones on the market, like the Hexo+, actually fly themselves, so you can focus on making event magic. With the the Phantom 2 camera drone, you can also automate a flight path so you can better adjust camera angles. And the Lily drone boasts a waterproof body and insulated motors, so you can safely land it in water. But they are still dangerous. Google “drone crashes” to find lots of entertaining footage of of robots falling out of the sky. Drone remote control technology takes a bit of a learning curve, since you are working in multiple dimensions. And when operating ones of these devices near large crowds, the danger inherently grows. And flying drones actually might be illegal. However, if you charge money for the footage from your recreational-use drone, it is no longer considered recreational. And no, the FAA won’t let you fly a drone over a crowd of people. 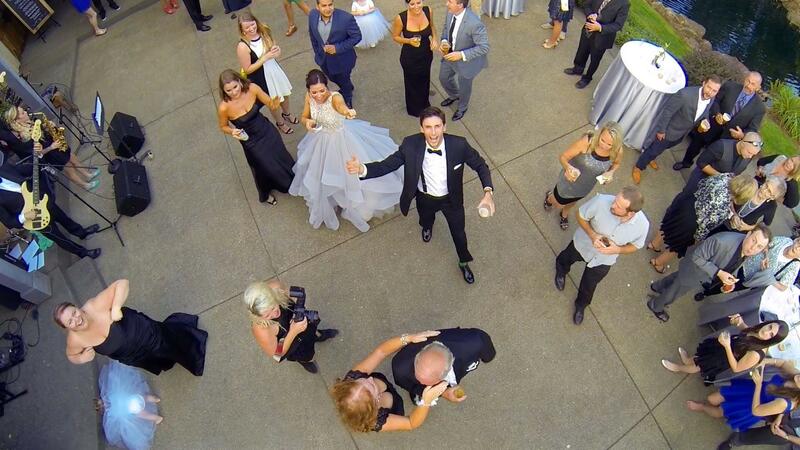 But that doesn’t mean you can’t still get an amazing aerial shot of your event from a safe distance. Your best bet is to hire a professional. JJ Trinidad, owner of Skyecam, an aerial cinematography studio based out of Los Angeles, charges upwards of $1,500 for a few hours of aerial event photography on their lower-resolution cameras. And that price includes a three-person team: a drone operator, a camera operator, and a visual observer to ensure that no birds (or power lines) are injured during the production of your film. If you’re looking for aerial event shots, Trinidad says you don’t just need a photographer, you need an experienced pilot, too. More dynamic footage simply means more risk. But a high demand for that kind of footage also means more supply. Safe drone-specific cinematography shops are popping up all over the country. Above Summit Films is a cinema group that services the greater New England area and has extensive safety information listed on their site about their aerial photography services. But their drone wedding demo reel has a castle in it. Does your event feature a stunt? Try Periscoping or live-streaming the aerial footage directly from your iPhone. That’s exactly what Eric Chang, drone videographer extraordinaire did at Burning Man in 2014. Are there fireworks? Even better. This promotional video for the Sony Action Cam proves that big bangs are even better up close. Big race? Conference expo? Outdoor concert? Dance party? Boat cruise? All made a thousand times cooler with an aerial shot. At Splash, we like to encourage our clients and party planners to document their events via any means necessary. Often that implies professional photography and videography, but user-generated social shares, and emerging tech like aerial photography and live streaming is often edgier and more authentic. Just play it safe. We’re rule benders, not breakers. For a more in-depth dive on drone regulations, aerial sports videography, and reviews of specific products, read this helpful write-up via DC Rain Maker. Plus, check out Know Before You Fly, an educational campaign founded by several organizations in partnership with the FAA. Or send it to a friend with a drone. Ben Hindman is co-founder and CEO of Splash, the country's fastest-growing event marketing platform that helps businesses and brands more effectively market through their events. An event planner turned tech entrepreneur, events are in Ben’s DNA. Prior to starting Splash, Ben was the Director of Events at Thrillist, where he produced large-scale events from concerts to mystery fly-aways. He also co-founded the invite-only Summit Series, a premier event which attracts the world's leading entrepreneurs. Before that, Ben founded and sold DC By Foot, DC's only free walking tour company. In another life, Ben goes by Benny Beatbox, and has performed at the White House and on stage with Naughty by Nature – but not at the same time.